Each detail at Sarah + Mike's Harborside East Wedding contributed to making the evening such an exciting celebration! The happy couple said "I do" under a simple yet stunning floral arbor backdrop decorated by Branch. A glamorous gold mirrored seating chart led guests to their seats, where they found their names written on mussel shells in gold calligraphy. Guests helped themselves to Mosaic's delicious hors d oeuvres and stations that satisfied each guest's palate. There was a southern comfort, flatbread, and slider station - all which were a huge hit! Dinner was topped off by a mouth watering red velvet and vanilla tiered cake from Sablee. Guests enjoyed the rest of the night dancing to the musical talents of DJ Wade, who had just as much fun as the crowd! Sarah + Mike were showered with love by all of their friends and family, which made the showers happening outside insignificant to the couple and their guests. Charleston Style Limo shuttled guests from the venue to the hotel as the night drew to an end. Best wishes to the newlyweds! The April showers were in full swing during this beautiful Harborside East wedding for Liz + Jason last spring. 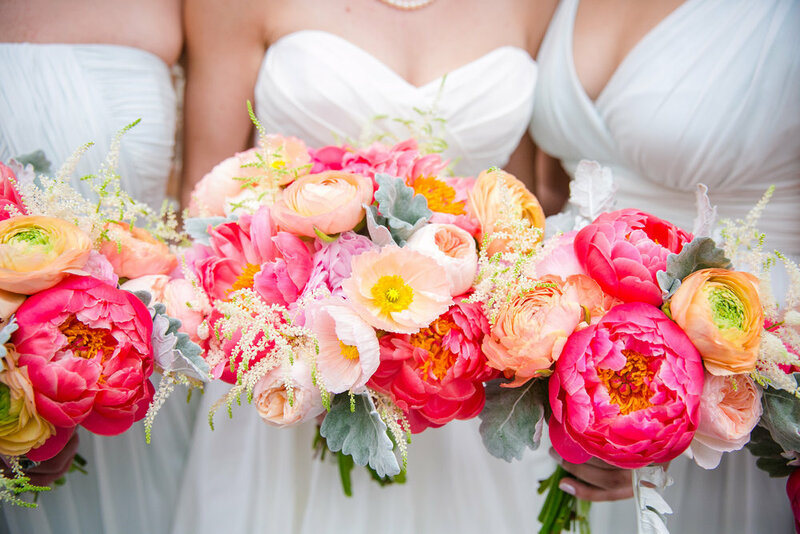 Even with a bit of darkness in the clouds, this wedding glowed with bright pops of light blue, orange, and hot pink! We loved this colorful design and it reflected the bubbly personality of this adorable couple.Personal details provided by the bride were scattered all over the reception space. Guests enjoyed a delicious treat provided by King of Pops and watched as the bride + groom departed in a vintage Bentley. We wish these newlyweds a lifetime of love, laughter, and happily ever after!